Let's Have a Reading Party! 1. Let's have a Reading Party! 16. 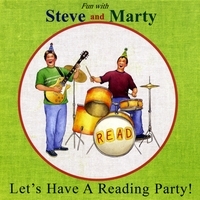 Reading Road Trip, U.S.A.
“Let’s Have a Reading Party!” is the new CD by award-winning singer/storyteller Steve Blunt and best-selling author/illustrator Marty Kelley. It features 16 funny, original songs & stories that celebrate reading for kids aged 4-10. There are several all-new musical recordings by Blunt & Kelley together, as well as spoken-word “read-along” versions of Kelley’s books: The Rules, Fall is Not Easy, Winter Woes, Spring Goes Squish, and Summer Stinks. A number of Blunt’s library songs from past years are also included: “Reading Rocks the Granite State,” “The Pirates’ Reading Song (Treasure Reading),” and others. Musical styles range from old-time folk/country on “Catch the Reading Bug!” to kid-friendly punk rock on “Summer Stinks”—an adaptation of Kelley’s book of the same title, that is sure to be the hit of the season! The Whole Set of Songs Is a Reading Party! As a member of The Children's Music Network, I'm familiar with Steve Blunt's great take on music kids wll love. What's more, they'll learn from Steve's positive messages couched in humorous lyrics and performed with passion and power. I got Steve's Hang On, Henry album some time back. When my grandchildren are with me in the car, they ask to hear that cd over and over; so I knew I'd be in for a treat with Let's Have a Reading Party. When I checked out the songs, I wasn't disappointed. The album's super. As a singer-songwriter and reading teacher, these are songs I desperately wish I had written. But I'll borrow them from Steve, and that'll be the next best thing! Reading-together, Echo Reading, is a great way to learn, and all these Read-Alongs are super funny and clever. The Pirates' Reading Song is a must-hear, and there's a great message couched in Steve's clever humor in You've Been Watching Too Much TV. Reading Road Trip, USA rocks out...No, the whole album rocks!